Our Happy Little Home: New-ish Curtains. I think I mentioned that we painted our living room a couple of months ago. It went from a pale yellow to a warm tan (Sherwin Williams Ecru). 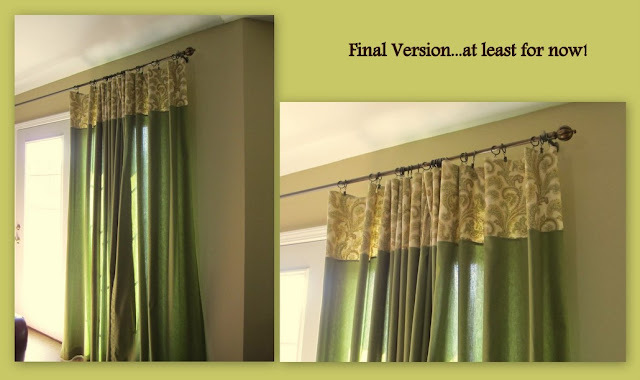 After we had painted, I had my helper (aka Dad) assist me in raising our curtain rods (i.e., I made him do it all by himself while I supervised!) by about three inches or so. This little change made a big difference in the room (Thanks, Dad! )but...it meant that my curtains looked like they were ready for a big flood. 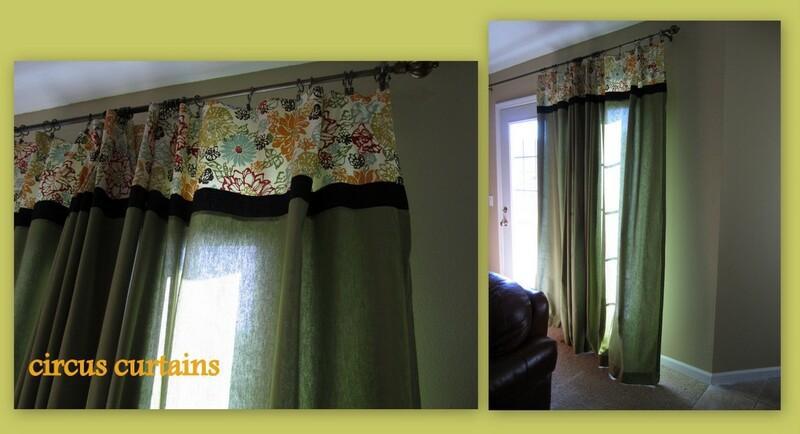 ...but I quickly tired of my "circus curtains." I think that I can live with these for awhile. Check out the painter's drop cloths at Lowes/Home Depot. 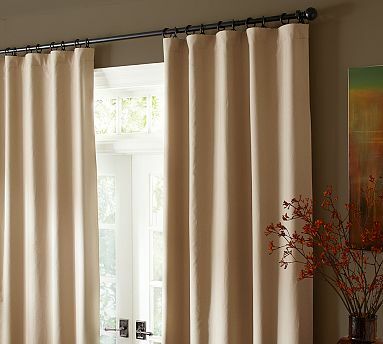 They make great, cheap curtains when you're looking for something neutral and Pottery Barnesque. I love the circus curtains and the new leaf pattern ones. Nice job! I always like curtains that have a band of contrasting fabric. I think it looks smart! I so need to get started on curtains. 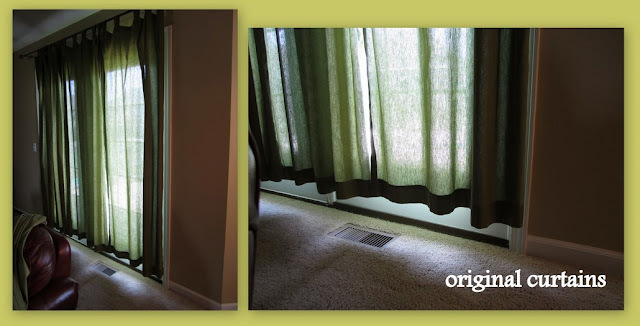 Nothing makes a room feel complete like window treatments! great job improvising on the curtains!! When I was looking for curtains and trying not to spend a lot I thought about buying shorter ones and adding fabric to them. But, my mom and I (mostly my mom) ended up making some. They turned out nice. I need to post a pic of them. Both of the curtains look great! I love the little bit of added color and pattern. I have a chair from peir 1 covered in the first fabric! Where did you get that? I love the colors in it!! thanks for checking up on me! I have been so busy with the kids this summer. I actually started a blog post a few days ago and just haven't had a chance to finish it. Apples, and Cupcakes, and Owls! Oh My!